Louvered vent inserts for Dodge, Freightliner, or Mercedes Sprinter. Black powder coated finish over aluminum. Quality "Made in Germany" product. Easily installs over window. Roll down window, place Airvent in window track and roll up window. Netting behind louvers keeps out insects. Very secure. Can't be removed from the outside. 2 piece set - both driver and passenger Airvents are included. Imported - Made in Germany. Usually ships by next business day. Please allow 1-5 business days for delivery to most US addresses. Express shipping available. 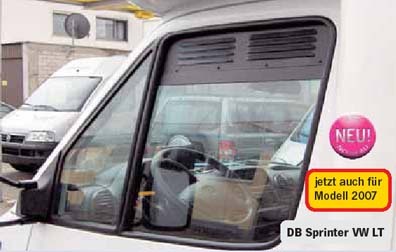 We are very pleased with the addition of the window vents to our Sprinter. There is a tiny gap in the corner but overall it has helped with the airflow in our van. The vents need to be coaxed into position. They are tighter than they need to be. They do the job but they don't reflect the German precision they're advertised to have. Great low tech way to keep my sprinter cool in the sun. Well built. This simple device makes my sprinter much better ventilated. rain does not get it. the window seems just as secure with the device in place as it is completely closed.